For every case of dementia, mind maps can potentially be used to improve the quality of life of the patient, caregiver, and family. Many people in the later stages of dementia are confused at times, frequently unresponsive, have minimal access to their memory, and can be aggressive and otherwise difficult to deal with. In spite of this, the care of almost every dementia patient, even one at a very late stage dementia, can be improved by mind maps and other visual thinking tools and better care will almost always produce a better quality of life. Mind maps and other visual thinking methods are better ways to capture, store, manipulate, share, and understand an individual case. Image that. A method that costs pennies per use can improve the efficacy of $200 doctor visits, $20 pills, $3000 emergency room visits, $150 of home healthcare, and $1000 consultations because at the end of all the fancy stuff, mind mapping is an intuitive, easily understood method of communicating among and coordinating among the many parties that collectively are the care system for an individual person with dementia. No, simple mind maps will not substitute for medical treatments, but they can make the individual healthcare system developed for a person with dementia more efficient and help cut service redundancies and unneeded tests and treatments resulting from poor patient-doctor-family communications. Among other ways, mind mapping and other visual thinking methods can be used even with patients with advanced stages of dementia. While people in advanced stages might be limited in their ability to draw maps, they may be still quite skilled in reading them and picking up on associations. 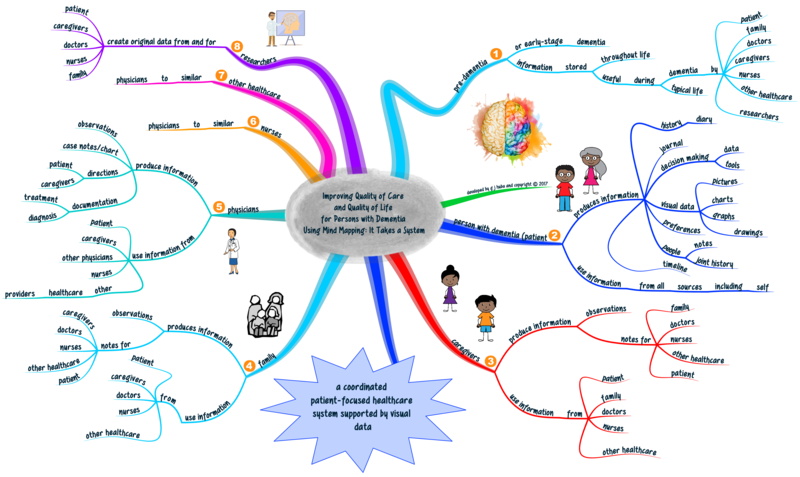 Whether or not patients with dementia can draw (or even read) mind maps at the end, caregivers, doctors, nurses, families, and others may use these visual methods of communication to easily share information among themselves. If the patient has created a “pre-dementia” set of diagrams for her or his life experiences, there will be a useful baseline for healthcare providers to better understand the individual case. Good communication. Good coordination. Knowing the issues. Applying the best thoughts of all people in the care team (including the family, caregivers, and patient). Using the best treatment methods useful for the individual with dementia. And all because mind maps (compelling visual methods of producing insights into complex issues in a simple way) make communications clearer and more reliable, allow a patient to take part in her or his own treatment, and do so at a low-cost that makes the care team more effective and the patient and family happy about the quality care the patient is receiving. Sounds almost too good to be true. It isn’t. 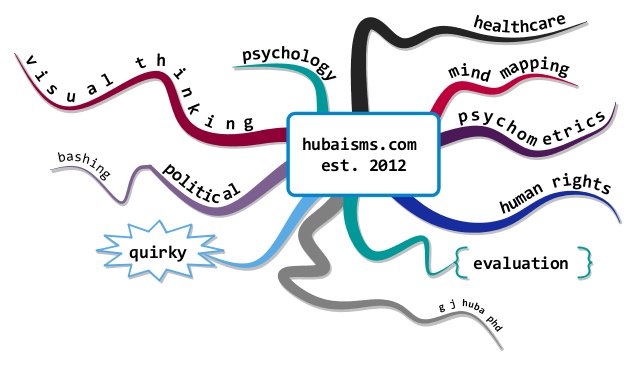 Click on the mind model (mind map) shown below to expand its size. I know that a simple version of the outlined model has worked super well for my (dementia) care. It could also work super well for you or a person with dementia for whom you provide care. If you have not read the Introduction to this series of posts, it is important that you read it before this post. Click here for the Part 00 Introduction. This post is part of a series of more than a dozen posts. I worked on understanding health and social service programs, especially for the disabled, poor, disenfranchised, and traditionally underserved as a program evaluator for about 25 years. I was very good at it and worked with hundreds of programs spread over most US states. In writing about my activities to achieve stability in my dementia and maximize my quality of life, I am going to employ the tools of program evaluation to describe what I was trying to achieve, what I did to achieve my goals, why I did various activities, and which parts of my interventions seemed to help me the most. No, not in this post but in a series of more than a dozen posts. In this post I will start by describing the activities I designed for myself and did throughout my period of diagnosed dementia over six years of living with the disease. In subsequent posts, especially Posts 02 and 03, I will discuss the outcomes of my activities. After that, I will address some of my activities — and especially those that “worked” extremely well for me — and describe them in depth, show how other individuals might use these methods, and how dementia caregiver and healthcare systems might be built around them. The image below is a mind map. Should you not be familiar with how a mind map is drawn and read, please search this website for posts on mind mapping using the search box. Or, go to the home page by clicking here and look at the list of pre-defined searches. A very simple set of rules for reading a mind map is as follows. Start at the center of the diagram. Each of the topics (ideas or major branches) that come out of the center represents an issue. Important information about the main issues is given as a series of branches. The organization is in an outline or tree where large branches divide into smaller branches and smaller branches divide into even smaller branches. Go around the map in a counter-clockwise manner (to 2 o’clock, 3 o’clock, etc. ), following the branches down to their branches and their branches and finally to twigs. Remember that we are looking down at a whole idea [or tree] and its branches and their branches in order to understand how the information represented on these branches goes together and what the most important information is. The mind map is thus a picture of major ideas followed by its major subdivisions or branches and sub-branches. The “big ideas” are attached directly to the central issue. 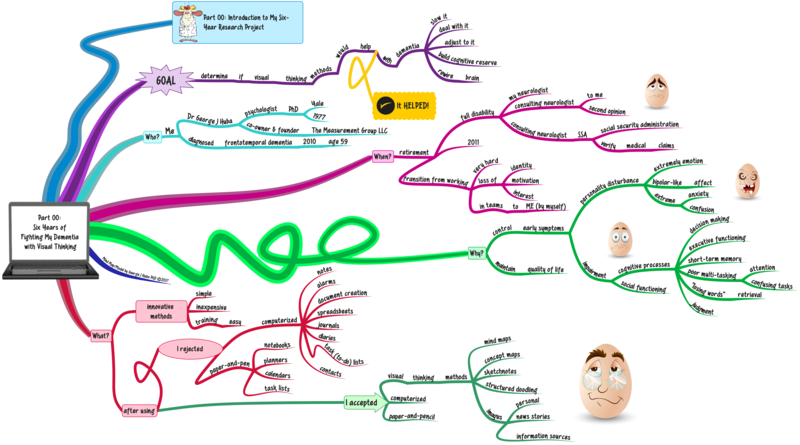 A mind map is a way of showing in an image how a set of data pieces or ideas go together. The pictures, color coding, and fonts are used to designate what is the most important information in the mind map. When you are trying to remember or organize or determine priorities, the pictures, color coding, and size of the fonts can help you store information in “visual” parts of the brain and then retrieve it by thinking about pictures, the color coding, or size-importance of the information. Click on the mind map to expand its size and zoom to various portions of the map. As you can see, I tested app after app after app on my Mac and iPhone to see which could help me. I read all about how to mindmap and draw sketchnotes and I practiced and practiced. I learned to read “dog” and taught my Newfie to understand “people.” I doodled, watched the news, built a highly-rated social media following of more than 140,000 individuals interested in healthcare, dementia, visual thinking, and 100s of other topics from around the world. I went to concerts, watched movies, and cheered for the two local universities with huge sports programs. I engaged some new parts of my brain. I thought in pictures. I LEARNED MANY NEW THINGS THAT STRETCHED MY BRAIN INTO NEW CHANNELS. I THINK I PROVIDED NEW INFORMATION TO PERSONS WITH DEMENTIA AND COGNITIVE DECLINE, CAREGIVERS, HEALTHCARE PROFESSIONALS, AND THE GENERAL PUBLIC. I FEEL GOOD ABOUT THIS. Stay tuned, the interesting stuff starts next. In 2010 I was diagnosed with neurodegenerative brain disease with the initial diagnosis being supranuclear palsy which was later amended to the highly related frontotemporal dementia, behavioral type. Some believe that PSP and FTD are variants of the same disease. I started to examine Mac and iPhone/iPad apps that might be useful early in 2010. After I retired in 2011 I started to use a number of the apps for such things as calendars, task lists, alarms, reminders, and other business-like functions. The business-like apps failed to motivate me to use them continuously nor could they address executive functioning problems that were at the core of my disease. As early as late 2011 I had concluded that mind maps and other visual thinking methods could be very helpful. As I read about every mind map book around by dozens of authors and bloggers, including the majority of those written by Tony Buzan who makes the claim he is the “inventor” of mind mapping (it is a silly claim no matter who makes it), I rapidly discovered that virtually all visual thinking work focuses on lucrative management consulting that few who use it have strong background in substantive areas like medicine, healthcare, psychology, and related disciplines. What little work exists in mind mapping and other visual techniques within the health and medicine areas indicates a total lack of understanding of visual thinking and is generally painful to read. I wasn’t scared off by the fact that there was no clear guide to what a person with cognitive impairment and later dementia could do with visual thinking procedures and computer apps to try to improve the ability to cope with dementia. 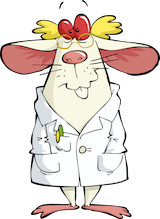 I had, after all, spent 35 years of a successful career as a (nonclinical) psychologist and much of my career had focused on developing new applications of psychological knowledge to addressing medical, psychological and social disorders. And much of the 35 years were spent studying the service care system for those who were least connected with society and traditional healthcare. I am writing a series of posts (currently more than a dozen) evaluating my experiences during the last six years with a progressive brain disease. Each will focus on a specific test of methods and outcomes I think were achieved. My studies are one-subject research (often called N=1). I will present results that I believe can be inferred from specific indicators. However, what I discuss is DERIVED FROM MY EXPERIENCE AND MY INTERPRETATIONS OF THE OUTCOMES OF WHAT I DID. I do not claim that any of what I write about is applicable to all people or that what I did should be considered to prove anything as opposed to simply observing it in myself validly or not. And, I see no evidence that the outcomes from what I did have done suggest I found anything to treat or cure or slow the progression of dementia: I never expected them to do so. What I do believe that I have demonstrated for myself is that these methods have helped me maintain a much higher quality of life. Not more days in my life, but many more good days while having dementia. I feel blessed to have received those extra good days. Most of my “writing” is in pictures. That’s the point of visual thinking. The following mind map is a general introduction to my work over the past six years. I call it Part 00. Starting with Part 01, I am going to start to present both observations and objective indicators of what happened for me. Should you not be familiar with how a mind map is drawn and read, please search this website for posts on mind mapping using the search box. Or, go to the home page by clicking here and look at the list of pre-defined searches. Click on the mind map below to expand it and let’s start the process of understanding of what visual thinking methods help me to do. Click the image to expand it. And, yes you are correct, this is the same diagram as in the prior post with just the title changed from sketchnotes to mind maps. I think that is the exact point I am trying to make. 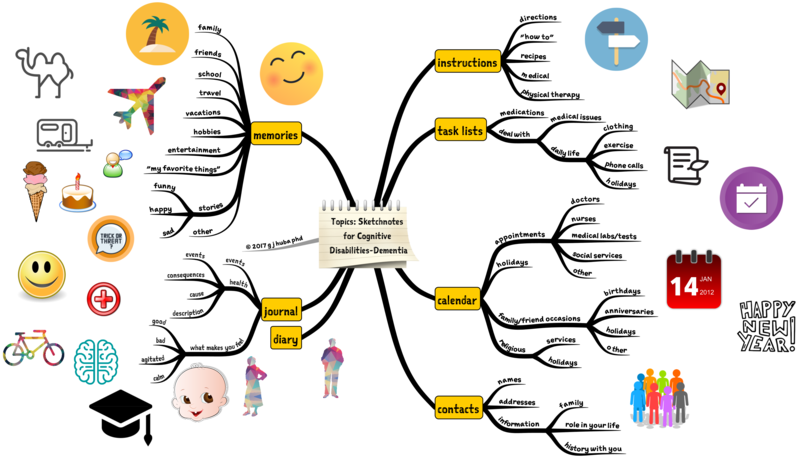 I have come to the conclusion that the process of mind mapping forces a structure onto the brain that can help it deal with some of the problems of dementia. Mind mapping — at least for me — seems to force a structure for attempting organized thought that engages different (undamaged?) parts of the brain. I have no proof: there have been no brain wave studies of individuals while they are using visual thinking methods. My experience of five years has led me to believe that is why my mind mapping works. I await some formal studies which will reassure others if not me. I often post about a trio of visual thinking methods that I use (I believe successfully) to deal with my own dementia. Yes, this is one more post on the “trio topic.” This differs from the earlier posts in that it tries to use a commonsense and nontechnical language to explain how and why these methods seem to work. Click the mind map to expand it.